Every 15 minutes or so, there are buses that can take you to Milan’s central train station from both terminals – Milano Centrale. As soon as you arrive at the airport you’ll see many booths of different companies that advertise tickets for the shuttle buses into downtown Milan. However, my advice is to go directly to the where the bus stands are located and watch for the signs “Milano Centrale”. Ask which bus is leaving first and then get a ticket directly from the driver. This way you’ll get the cheapest deal, and won’t have to wait long for the next bus. 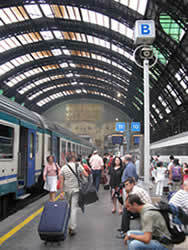 There is an express train directly from Malpensa airport to Milan Nord Station. Keep in mind that this is not the main Central station in Milan. You will have to take the subway or taxi to get to the central station. However, likewise from the Malpensa train station there is a train which goes to Como’s Nord Lago Station (with a change in ‘Saronno’) which drops you off right at the ferry terminal in Como. If you plan to travel by boat or bus, after arriving in Como, this is the best connection for you since from Milan’s central station you can only get to the other station in Como called S. Giovanni. 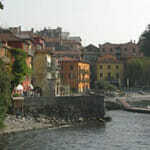 From Como’s S. Giovanni station you can get on a bus to Bellagio or any of the other towns on the western leg of Lake Como, but it would be a bit of a walk to get to the ferry harbor from this station. 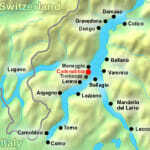 Keep in mind that if you arrive late in the evening, it is difficult to rely on public transportation to get you to Lake Como as their are no late buses or ferries. (The last C10 bus leaves at 18:44 from the Como station). You may also not feel like driving in the dark – remember that the sun goes down much faster in Lake Como due to the tall mountains. So if this is the case…fortunately, there are some great hotels near Malpensa airport with sound-proof windows that can block out air traffic noise. The four-star First Hotel near Malpensa Airport (tel: (0)3 31 717 045) is situated at the airport, mid-way between the terminals. Travelers should phone the hotel upon arrival at the airport for free shuttle pick-up. The Hotel Villa Malpensa (tel: (0)3 31 230 944) is located in front of Terminal 1 in an early 20th century villa. Linate Milan aiport is a smaller airport which used to be the main Milan airport until lack of space and increasingly high demand caused most airlines to turn over to Malpensa airport. The nice thing about landing here is its short proximity to Milan (10km). There is a shuttle bus that conveniently takes you to the city center. If driving, the P41 takes you right to Como. Orio al Serio Milan airport serves the low-cost airlines of Milan. 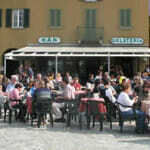 It is located 45km from Milan and 5km from Bergamo.There are frequent buses that can take you to Milan and Bergamo. If driving you can take the A4 highway into Milan and then switch to the A8 to Como. 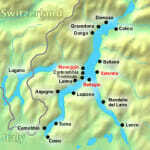 By train, it is best to take the direct train from Bergamo to Lecco. Then switch trains to get to Varenna (east side of Lake Como) from which you can take a ferry to the other side of the lake and Bellagio. Finding your ideal Milan airport requires careful planning and a good knowledge on the three available airports you have to choose from in this interesting city. Linate is one of the biggest Milan airports. 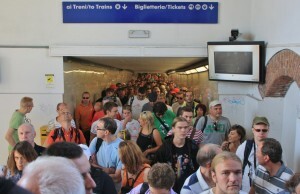 It is crucial heart in Northern Italy and constantly packed with passengers. Some people use it for passage, other come to Milan or abandon it. Loads of people that come to Milano with business purposes prefer to stay nearer to the airport to have great access to it. That Is why there’s a great option of comfortable lodging in Linate airport region. Hotels around Milan airport will also be wonderful spots for conventions as well as other occasions^ most part of these offer spacious conference halls and ball rooms. Although not found in Milan itself, many airlines often refer to it as a Milan airport. Bergamo is a town divided into two parts, which an immensely charming upper section (the old section). Any journey from Bergamo airport to anywhere else in Italy will require a journey throughout this quaint little town, which may make for a fun day trip. Malpensa managed over 23.8 million passengers in 2007 (over 33 million with Linate, the second airport of Milan, nearer to downtown and more than 39 million with Orio al Serio Airport, Milano’s low cost airport). As of early 2008, Malpensa remains the top Italian airport in terms of international traffic, collectively with Rome Leonardo da Vinci Airport in terms of absolute passengers. As far as hub transit passengers are involved it’s also the 2nd airport in Italy after Rome, based on ASSAEROPORTI traffic data. 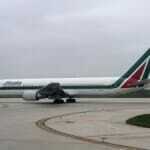 It is also the leading air freight entry to Italy. Malpensa serves a population of more than 15 million inhabitants. From Malpensa International Airport 2 straight to Milano, there are numerous stands for numerous bus businesses. One attempted-and-analyzed service is known as Malpensa Shuttle Purchase your ticket in the stands found in the arrivals section before boarding the bus. Although you can always just go outside and purchase directly from the drivers – this is actually preferable in many cases since then you won’t have to wait for only one type of company. A single prices EUR10, or you’ll be able to ask for a return ticket for EUR16. For the trip from Centrale to Malpensa, there’s a ticket stand near the east exit of Centrale, and the bus is boarded in the next bus stops. Ferrovie Nord (FNM) and Trenitalia (FS) are two distinct railroad track systems, with different stations, distinct trains and distinct tickets. For example, if you need to visit Malpensa airport and you’re in FS Greco Pirelli, you need to go first to Garibaldi stop, then take MM2 metro to Cadorna train-station and subsequently the Malpensa Shuttle train to the airport. In order to get to Lake Como, you will usually have to take a shuttle bus to the centre of Milan, and then hop on another train to get to where you need to go. Use this handy tool to help you get around. Italy is one of the most exciting nations of the whole world, with Milano as its pinnacle place of interest. This metropolis is among the major international fashion capitals , and has been receiving a stable flow of vacationers and expert travellers for the last few decennia. People travel to this location for varied reasons, but the one thing that these visitors all have as a common factor is the want to have their own separate transport , this is why so many people opt to utilise the services of Sixt car rentals in Milano. 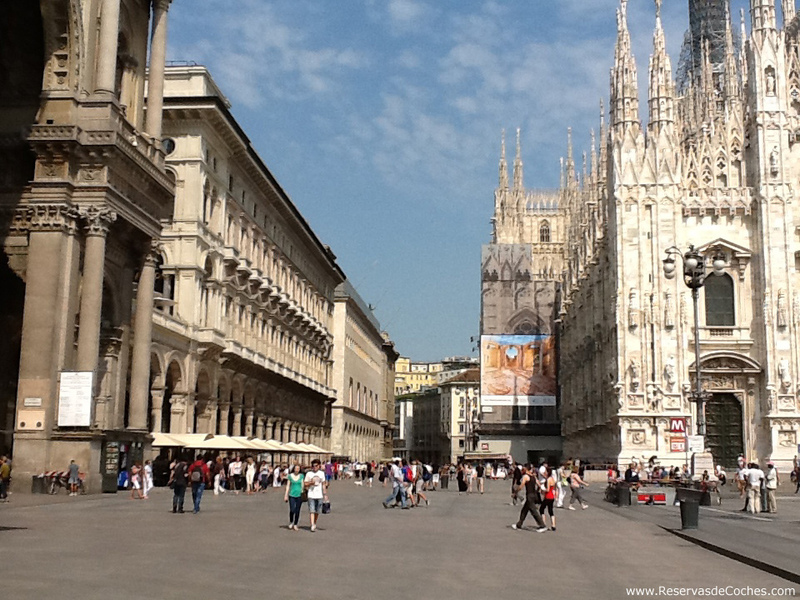 Milano sees over 2 million travellers every year entering the nation. Each individual may have a different mission, however they all fall in love with Italy all the same. There are several landmarks to see, in addition to significant museums, theatres, and galleries. Some of the greatest works of Italians are to be found here, such as those by Michelangelo or Leonardo da Vinci.